Not going to lie, these were simply amazing. I made enough for two full meals and oh my, it was one of the most satisfying SIBO-meals I’ve come up with! It’s a very simple recipe but it took me much longer than expected as my back still has been bothering me so much. I woke up with an image of a gorgeous bowl of noodles (zoodles, actually) in my brain and I decide that it had to become a reality. The best part is, it turned out exactly how I had imagined and tasted even better, which naturally made me feel really good – like I had accomplished something. Believe me, SIBO diet is HARD and so to come up with a super delicious recipe using really limited ingredients feels GREAT. Your gut is happy. You are happy. And your creative energy is so well utilised! Let’s see what we’ve got in here. One whole zucchini turned into zoodles. You could use a spiralizer if you’ve got one – I used a peeler that does somewhat a similar job and works fine for now. It leaves you with the core, that fleshy portion of a zucchini and instead of discarding it, I turn it into little “meaty” nugget looking things which taste so good when stir-fried with a basic seasoning – I used salt, crushed red and black pepper and coriander seeds with a little bit of smoked paprika. Then I’ve got stir-fried spinach, once again, with really simple flavours – salt, pepper and lime juice. I made simple pan-fried eggs which I later sliced into thin pieces for serving. And finally, the main star of this recipe, a cream coconut curry sauce. I call it curry ‘sauce’ because I made it slightly thicker but it works fine if you add more water and make it soupy too! 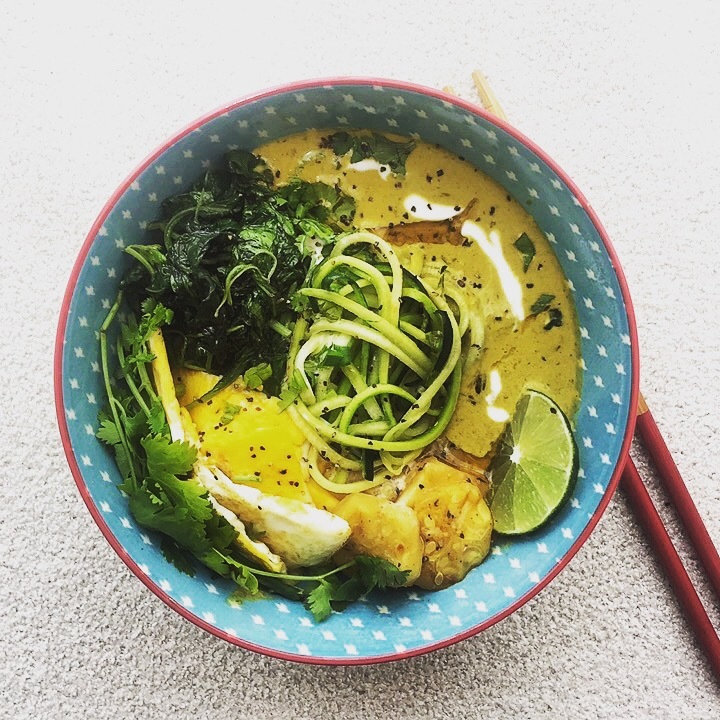 SIBO-friendly Asian Curry Sauce: All it really consists of is toasted sesame oil (I love the nutty flavour it adds to your food), tiny bit of ginger paste, soy sauce, turmeric powder, red chilli powder (adjusted to my diet but add as you please! ), lots of chives, fresh coriander, dried lemongrass and galangal powder, curry powder (optional) , dried kaffir lime powder, and finally, coconut cream or milk. To add sweetness and get the right consistency, I used coconut water instead of drinking water. I sautéed all ingredients (except coconut cream) in sesame oil and blended it into a thick paste. Put the paste back into the same pan, add coconut cream/milk and water and let it simmer. Keep stirring until it forms into a semi-thick and creamy curry sauce. 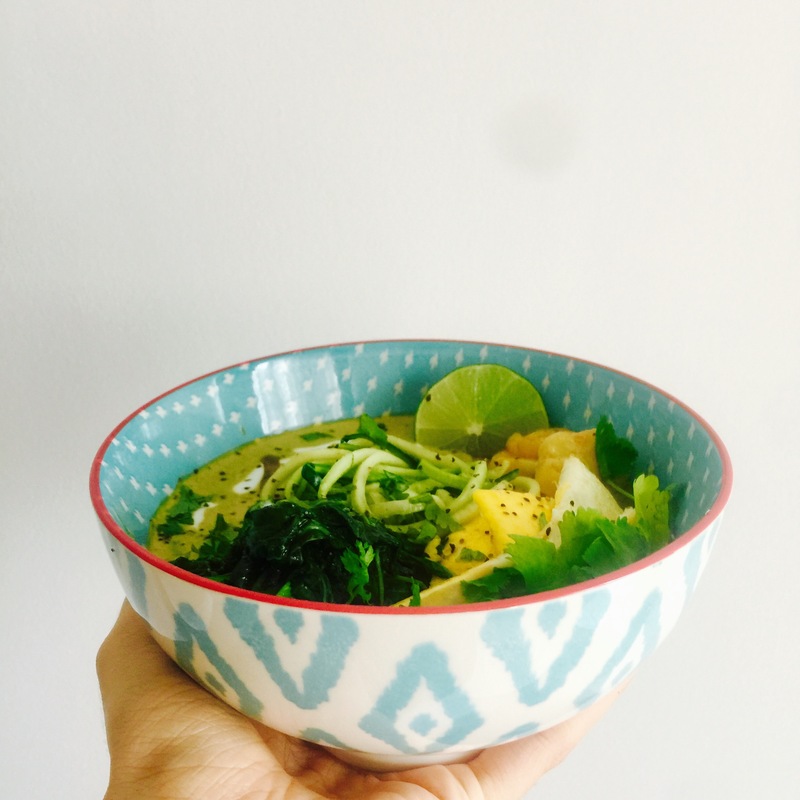 To serve: Grab a pretty bowl, put a handful of Zoodles right in the centre, add your sliced eggs and other vegetables, garnish with chopped coriander and a sliced lime. Add extra crushed black pepper or tobasco if needed. I saved a bowl for my friend and she came by the very night to have it. She absolutely devoured it and asked me twice if it was SIBO-friendly friendly and I couldn’t help but smile. Well, it took me a while to believe it for myself but it most certainly is SIBO-friendly, grain-free, dairy-free and somewhat gluten-free if you exclude soy sauce and use salt instead. You could totally turn it vegan and vegetarian by substituting egg for sautéed tofu or any other vegetable that works for you. Topping options for those without restrictions or personal preferences are absolutely limitless so just play around! My friend even said she’d happily go on a SIBO diet if this was the kind of food that she could always have. Umm, no, I don’t think anyone must go on a SIBO diet unless medically necessary. But I get it, it really did turn out delicious! P.S. SIBO is such a complex bacterial infection and can translate differently in everyone’s body. Diets are carefully customised for each person and though there is are basic and rather strict guidelines to follow, what your diet comprises of is very specific to your body and symptoms. Please always ensure that you stick to your personal protocol as agreed between you and your medical professional.